If the east end of Irving Street becomes private property, the public will no longer have right to walk on this historic street, something they have done since 1813. "For whatever reason, some roads have ‘just always’ been there or have ‘just always’ been maintained as public roads. Long term use and/or maintenance can give rise to the presumption that the road is legitimately a public road. A road that achieves public status by virtue of continual public use is referred to as a public road by prescription." City Plan: Plaintiffs claim that Irving Street is not on the City Plan and therefore, not a public street. 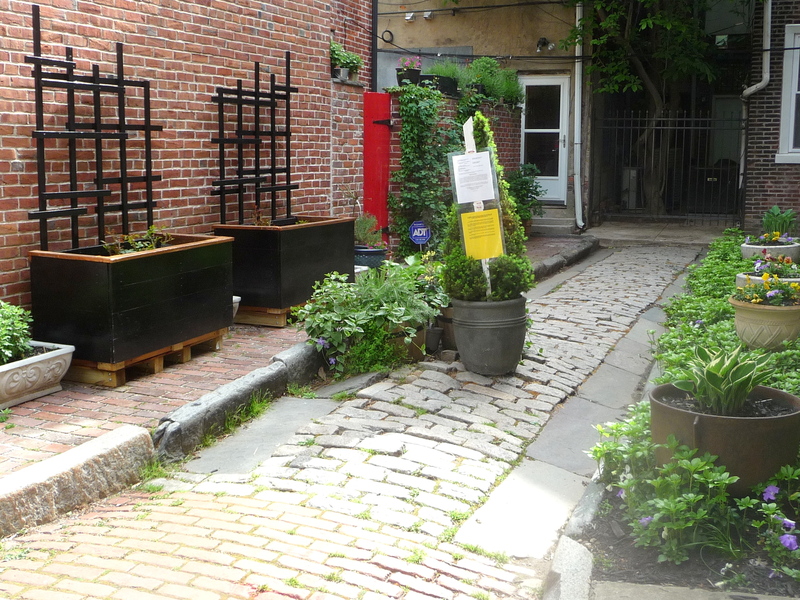 Adverse Possession: Plaintiffs claim that they are in "adverse possession" of Irving Street, meaning that they and their predecessors have been in control, possession, maintenance and ownership of the Alley for over 150 years. Plaintiffs claim that the City does not want Irving Street. Public Use: Irving Street has been used by the general public since at least 1813, which makes it a public road by prescription. Public Maintenance: Irving Street has been maintained by the City through the construction of storm drains and rounded curbs designed specifically for a four-way intersection and to take runoff from the east end of Irving Street and South Jessup Street, which makes it a public road by prescription. Irving Street has been recognized and controlled by the City through the Philadelphia Historical Commission, who designated it a historic cartway, set strict conditions on its maintenance, and provided funds for the repair of historic cartways. In those documents, all the streets are described as "accessible" and used for "transportation". Among the 222 streets, only three are listed as private, and Irving Street is not one of those private streets. If the City of Philadelphia allows the plaintiffs to gain private title to a street that was for almost 200 years in the public domain, we believe that amounts to a case of "unjust enrichment" and at the public's expense and a general denial of due process. For it is clear that plaintiffs chose a legal route that did not allow for public input (i.e, applying for a zoning permit), but instead chose a course that would require a substantial amount of capital to defend the east end of Irving Street from privatization. A fundamental question: If someone today gets injured on the flat surface of the east end of Irving Street due to the condition of the street, who would be held responsible? Clearly, the plaintiffs are not responsible for the flat surface, as they do not own the street. In fact, there is no deed to the street. However, some entity must be responsible and we believe that entity is the City of Philadelphia. Additionally, since the city has performed maintenance for Irving Street, and the public has used it since 1813, the east end of Irving Street is a public street of the City of Philadelphia "by prescription". Plaintiffs rest their legal argument for title to the east end of Irving Street on "adverse possession" and "operation of law". In addition to Historic Commission restrictions and utilities maintenance, according to witnesses, the city has also issued parking tickets on the east end of Irving Street, although Parking Authority records do not discern between the east end and the west end of Irving Street. Regarding "operation of law", plaintiffs state, "Pennsylvania State Law holds that where a deed references as a boundary a right of way, the title of the property extends to the middle of said right of way, if the original grantor held such title." (Quiet Title, #27) Correction: That law might apply to roads that are planned, but never built (i.e, paper streets), or roads not used by the general public or maintained by the city, none of which applies to the east end of Irving Street. a) Plaintiffs are implying the "Mr. Burd" was Edward Shippen Burd. He was not the "original grantor" and therefore his will does not apply. It is admitted that Edward Shippen Burd purchased the property in 1812 from John and Mary McKim for $10,000. The property extended from 215 S. Jessup Street southward to the dead-end, and from the east side of Quince Street eastward to 11th Street (see - http://www.saveirvingstreet.org/McKimToBurd.PDF and MAP http://www.saveirvingstreet.org/McKimToBurdMap.PDFit). However, it was his father, Edward Burd, who developed the property and whose name is on the deeds to at least 217, 219, 221, and 223, and is therefore the "original grantor". b) Edward Burd dedicated the east end of Irving Street to the city of Philadelphia. In the original deeds for various properties, including, but not limited to 217, 219, 221, and 223, Edward Burd is the grantor who "laid out" (i.e., dedicated) the 10 foot court behind these properties and "laid out" (i.e., dedicated) the 15 foot alley that is now known as Irving Street. Edward Burd, who died in 1833, bequeathed many of these properties in his will to his son, Edward Shippen Burd. It can be deduced that at some point in 1812 or 1813, Edward Shippen Burd transferred title to Edward Burd. Plaintiffs state, "The Alley is not on the City Plan and was never officially opened as a City Street." (Quiet Title #11) Plaintiffs state in other filings that the east end of Irving Street was never officially dedicated nor accepted by the City. In addition, in a letter from Frank Morelli of the Philadelphia Streets Department dated Jun 21, 2011, he writes, "...there is no record that it was ever opened as a public street" (Plaintiffs' Response Exhibit J). Correction: Note that neither official dedication nor official acceptance is legally necessary for a street to be a public road. Instead, public use and/or public maintenance are the determinative factors - http://www.lgc.state.pa.us/deskbook06/Issues_Land_Use_05_Road_Law_Basics.pdf. A street that is "laid out" is a dedication of the alley as a public street. Furthermore, Edward Burd not only "laid out" Irving Street as documented in several 1813 original deeds (including 217, 219, 221, and 223 S. Jessup Street), but Edward Burd also "opened" Irving Street as he states in the original 1813 deed for 266 S. 11th Street. http://www.saveirvingstreet.org/266South11thStDeed.PDF In addition, the east end of Irving Street was officially dedicated in the Ordinance of 1896 (also see Cover. Conversely, the west end of Irving Street is on the City Plan even though there are no records in the Streets Department of an official dedication nor acceptance. (See file). Plaintiffs state, "Plaintiffs' respective properties are bounded on the north (for the Navarros' property) and the south "for the Bigas' property) by a 10 foot wide courtyard/alleyway (hereinafter referred to as the "Alley". (Quiet Title #10) Irving Street is a 15 foot wide "street" (the road bed is 6 feet and the sidewalks and curbs are a combined 9 feet), as shown on many City maps, plaintiffs' own survey, and plaintiffs' own deeds. Regarding Mr. Morelli's comment in his letter (Plaintiffs' Response Exhibit J), "The decision not to include this stub-end street on the City Plan was an intentional one, likely owing to its narrow width and dead end status." It should be noted that the east end and west end of Irving Street are identical, both are 15 feet wide. In addition, S. Jessup Street is also a dead-end street. The "error" is dated 1946. In the Deeds Office, the clerk indicated that documentation on Parcel 212 ended in 1921 with an entry of “error”. In the City Archives there is an index page for Parcel 212 with no included record. It simply states “BLANK” on Transfer Reference, see http://www.saveirvingstreet.org/images/Blank.PDF. Plaintiffs failed to inform the Court that Irving Street is designated a "high integrity" cartway on the Philadelphia Historic Street Paving Thematic District Inventory (May 1999) by the Philadelphia Historical Commission, and as such, comes under the Commission's authority. Specifically, the flat surface of the cartway cannot be altered or repaired without the approval of the Historical Commission. NOTE: On the application, it is clear that all the historic streets (public and private) are designated for "unrestricted access". The plaintiffs have made it clear that they want to control behavior on the street and have made no comments about guaranteeing public access. Plaintiffs state, "The Planning Commission (the "Commission") has confirmed that ownership of the Alley properly resides with the Plaintiffs, and the Commission has warranted that when the Plaintiffs file their corrective deeds, said filing is not a subdivision but a statement of the correct boundaries of their respective properties." Correction: The Planning Commission did not “…confirm that ownership of the Alley properly resides with the Plaintiffs…” Instead, the Planning Commission staff (with whom we spoke) and the official Commission “Notes” (Quiet Title, Exhibit I) say the following: "The preparation of this plan by the 2nd Survey District does not imply approval of other city agencies." "A zoning permit is required for any proposed changes to lot lines including consolidation of existing parcels." This is a direction that Plaintiffs have not followed. In addition, the survey only shows the storm drain on the south side of Irving Street, not the storm drain on the north side of Irving. It should be noted that there are no storm drains on the opposite side of the intersection of Irving Street and S. Jessup Street, which speaks to the important role these storm drains played for storm water run-off for both Irving and S. Jessup Streets. Plaintiffs state that they "intend to maintain the aforesaid easement rights of any and all property owners who have easement rights of record to ingress and egress of the Alley, and shall not obstruct any such rights..." Correction: The opposite is the current situation. The Landeses are currently suing the plaintiffs for obstructing access to their easement. Plaintiffs are currently obstructing Irving Street and the sidewalk of 223 S. Jessup Street with planters; and their curbs, which are their responsibility, constitute a tripping hazard. If Plaintiffs are concerned about safety hazards, which they have claimed, they should move their planters, reset their curbs, and request that the Streets Department repair the street. Meanwhile, the appropriate road safety cones or barricades should be used until the work is done. South Jessup Street is under city contract to be repaired and restored in 2012 using funds set aside for historic cartways, according to the Streets Department. We have requested that the Streets Department repair Irving Street at the same time. As of May 10, 2012, plaintiffs of 221 S. Jessup Street have added more planters to their sidewalk, two of which take up more than half of their 4 foot sidewalk. See photo Although there do not appear to be regulations that cover planters, snow removal regulations do apply: Philadelphia Code, Title 10-720 (1) The owner, agent and tenants of any building or premises shall clear a path of not less than 36 inches in width on all sidewalks abutting the building or premises within 6 hours after the snow has ceased to fall. The path shall be thoroughly cleared of snow and ice. Where the width of any pavement measured from the property line to the curb is less than 3 feet, the path cleared may be only 12 inches in width. When the building in question is a multifamily dwelling the owner or his agent shall be responsible for compliance with the requirements of this Section. 160 (Amended, Bill No. 100752, approved January 5, 2011). Regarding Plaintiffs' Response to our Petition - Plaintiffs' Response is in general defamatory toward the Landeses and Irving Street. Plaintiffs' claims of lewd behavior and illegal parking are greatly exaggerated, if not groundless. A call to the police district yielded only one report. There have been only two parking tickets issued for illegal parking since 2005 when the Bigas-Valedons purchased their house, and it is inconclusive if the tickets were issued for the east or west side of Irving Street. Included in Plaintiffs' response is an alleged 1965 photo of white picket fence which purports to stretch across the east end of Irving Street from 221 to 223 S. Jessup. That photo has been disputed by the couple who owned 221 at that time. They have stated that no such fence existed. Also, in Response, a former owner of 223 S. Jessup Street strongly denies Bonnie Schorske's claim (Exhibit G) that he said that there was "no brick sidewalk on the north side of the house", and he also denies that he "indicated verbally that the property between 221 and 223 S. Jessup could be claimed since it was not on the city map." Here is a 1958 photo of 223 S. Jessup Street from Historical Commission files, note the brick sidewalk and no white picket fence - images/223SouthJessupSt.1958b.PDF / images/223SouthJessupSt.1958c.PDF. A 1964 letter from the Philadelphia Historical Commission to Miss Patricia Hoyle indicates that the east end of Irving Street may have also been used as the front entrance to rental properties, as it appears that some houses on S. Jessup Street were double houses with dual fireplaces and staircases. See letter. The weight of authority is to the effect that acceptance may be predicated on user, and the general current of modern authorities sustains the proposition that dedication may be accepted merely by long-continued public user, without any formal act of acceptance, even to the extent of charging the public authorities with liability for failure to keep in repair.’ 8 R. C. L. 16, 25/ 255 Pa.at 422-26. Public Road by Prescription: Pennsylvania Legislator's Municipal Deskbook, Third Edition (2006), Road Law Basics, Primary Methods of Street or Road Creation, Continued or Constant Use http://www.lgc.state.pa.us/deskbook06/Issues_Land_Use_05_Road_Law_Basics.pdf "For whatever reason, some roads have ‘just always’ been there or have ‘just always’ been maintained as public roads. Long term use and/or maintenance can give rise to the presumption that the road is legitimately a public road.4 A road that achieves public status by virtue of continual public use is referred to as a public road by prescription." Importance of deed descriptions: “The designation of a street as a boundary, in a conveyance of land, whether opened or not, if it be on land of the grantor, is an implied covenant by the grantor that it shall be open for the use of the grantee as a public way, and as a means of access to the land conveyed … it is also a dedication of the street to a public use.” Barnes v. Philadelphia, 27 Pa. Super. 84, 86-87 (1905) (quoting Ferguson’s Appeal; 117 Pa. 426 (1888); Dobson v. Hohenadel, 148 Pa. 367 (1892); Quicksall v. Phila., 177 Pa. 301 (1896) (The right passing to the purchaser is not the mere right that he may use the street, but that all persons may use it). See also Schenley v. Comm., 36 Pa. 62 (1859) (where the owners of land, which has been laid out into lots and streets, leases or sells the lots and describes them as bounded by certain streets, such streets thereby become dedicated to public use). Acceptance of a dedication may be effectuated through formal action of the public body or by long public user. Gass v. City of Pittsburg, 91 Pa. Super. 290, 297 (1927). Gass v. City of Pittsburg, supra, involved a question of whether a flight of steps and pathway that lead from an opened city street to an unopened city street, upon which were located the tracks of a street railway and, at the end of the footpath, a railway stop, was subject to public user doctrine sufficient to establish acceptance as a public street. There was no evidence of formal acceptance of the pathway by the city. 91 Pa. Super. at 293. The plaintiffs established evidence of the continuous and uninterrupted use by the public of the way for a period of more than thirty years. Id. at 298. Although not directed or sanctioned by the city, there was also evidence that a public employee performed some work on the stairway and that was properly considered in connection with the proof of user by the public “in determining whether or not the public generally looked upon and treated this way as an open public highway.” The Superior Court found that the extent of the public use amounted to dedication and acceptance and the upheld the jury’s verdict. Id. at 295. In Bond v. Barrett, 50 Pa. Super 307 (1912), the Superior Court found that a public way had been established on an alley running between two parallel streets and cutting a lot in half. The lots had been further subdivided so that a number of houses backed to the alley. The alley preceded the founding of the Borough of Dubois. The alley had not been improved, but was used for the delivery of “coal and other like purposes by those having occasion to use it, but its use was not extensive.” The court also noted, however, “the testimony clearly shows that from the time of such dedication there was an open way of some width used by the public generally as occasion required.” Id. at 314. The existence of any public use is limited potentially by the Act of May 9, 1889, 36 P.S. § 1961, (hereinafter “the Act”) which provides a “cut off” of 21 years after a street has been laid out and/or dedicated for acceptance to occur. However, the Act does not apply to Irving Street. The act of 1889 refers to ‘unused streets.’ Either technical opening or the fact of public user would seem to be enough to take a street out of the operation of the act. As between private and public use in this instance, such use as was at any time made was that of the traveling public. Sturges, at 50-51, 594. As has been pointed out by the court in Smith v. Borough of New Hope, 879 A.2d 1281, 1286 (Pa. Commw. 2005), the Act has only been applied to cases in which a “paper street” had not been opened prior to enactment. In other words, in that case the street had been laid out on paper as a plan, but was never acknowledged as, or used, as any kind of street. What is perhaps most significant in the Smith case is the court’s rejection of the application of Section 1724 of the Borough Code, which is analogous to the Act of 1889. The court found that Section 1724: applies to unused streets; streets which were laid out on paper, but never actually opened by the municipality or used by the general public. The legislature enacted this statute “in order to relieve land from the burden of public servitude created by a dedication in which the dedicated streets have been laid out but not opened.” Lillo v. Moore, 704 A.2d 149, 153 (Pa.Super.1997), appeal denied, 555 Pa. 713, 724 A.2d 349 (1998). Smith, at 1288. The Ordinance of 1896 officially dedicated the east end of Irving Street to be place on the City Plan. Interestingly, other than the certified Map of 1818 (which delineated, but did not name Irving Street and Latimer Streets), we found no ordinances that either dedicated or accepted the 200 block of South Jessup Street, 1100 block of Latimer Street, or the west end of the 1100 block of Irving Street, yet all three are on the current City Plan. This speaks to above case law, that public use - not official acceptance - is the determining factor for a street to be considered "public". Under common law, the fact that the Irving Street portion at issue is not a thoroughfare—that is does not connect one public street to another, but rather dead ends into the alley behind the Landes’ property--does not affect its ability to become a public street if the offer of dedication is accepted. Maier v. Walborn & High, 84 Pa.Super. 522 (Pa.Super.1924) (“There may be a public highway over a place where no thoroughfare exists: Bateman v. Bluck, 18 Q. B. (A. & E. N. S.) 870; Trustees of Rugby Charity v. Merryweather, 11 East 375 n; Dovaston v. Payne, 2 Sm. L. C. 199, note, (6th Am. ed.). A cul de sac may be a highway: Danforth v. Durell, 8 Allen (Mass.) 242; People v. Kingman, 24 N. Y. 559; Fields v. Colby, 102 Mich. 449, 60 N. W. 1048; 2 Bouvier's Law Dictionary (Rawle's 3d Rev.) 1438”). Regarding the 1871 state statute which provides that “No street shall hereafter be added to any confirmed plan of the city of Philadelphia and called a public street unless the same shall have been approved by the board of surveyors as to location, width and grade and shall extend from street to street as a thoroughfare.” Act of June 6, 1871. The statute has been held not to apply to streets which were opened and used prior to the passage of the Act. Appeal of Sturges, 240 Pa. 44, 50, 87 A. 592, 594 (1913) (technical opening or the fact of public user should be enough to take the street out of the application of the Act); Osterheldt v. City of Philadelphia, 195 Pa. 355, 45 A. 923 (1900) (“There is nothing in this statute that would justify us in giving it a retroactive construction, so as to apply to streets opened and used prior to its passage”). Section 14-2104 of the Philadelphia Code prohibits the creation of dead end streets of the nature here, but is presented therein as a design standard for new sub-divisions in the City and is not applicable to the already established east end of Irving Street at issue. The Smith case also involved a dead end street, and the court found acceptance by public use, despite some testimony that the only people who used the street were visitors to the five or so buildings located on the abutting lots. The court, though, also noted that the general public used the street to view the Delaware River, which is very similar to one of the many uses of Irving Street by the general public (i.e., to view the historic back allies and watercourse, as well as enjoy the ambiance that is Irving Street). Our Attorney - John S. Carnes, Jr. practice includes municipal law, general practice (real estate, small businesses etc. ), zoning, and civil litigation. He graduated from St. John's College, Annapolis, Maryland in 1983, and Villanova University School of Law, Villanova, Pennsylvania (1986). John's office is located in West Chester, PA.. (Click here to read John's resume) In addition, he has been the solicitor for the Democratic Party of Chester County from 2005 to the present. John has long been involved in municipal law and is currently the solicitor for the City of Coatesville and the Borough of Parkesburg in Chester County, Pennsylvania. In an amazing coincidence, when he was very young John lived in Josiah Elfreth's house on Elfreth's Alley, one of the oldest continuously inhabited residential streets in the country, (http://www.elfrethsalley.org/houses/137-elfreths-alley). John's father was a Philadelphia attorney, much of his practice involved real estate and included eminent domain matters. John's father was a professor at Villanova Law School at the time of his death in 1970.